Marvel comics and blockbusters need no further introduction and it’s really no surprise that Playtech Marvel slots series enjoy enormous popularity between online slot machines fans. Each game is based on a comics/movie with a similar name, features cool design and animation effects and multiple bonus features. Marvel slots also share a random network progressive jackpot which is usually worth close to 1 million dollars. It wasn’t easy, but here is our list of Best Marvel slots. Btw, if you are looking for some additional Super Hero slots, you should check the Dark Knight Rises and Superman slots which you can play for free on our site, and the brand new Batman and Catwoman Cash slot. 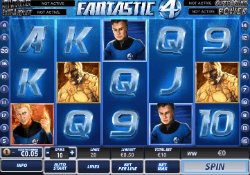 Fantastic 4 is a 5 reel, 20 paylines slot machine. Between all of them, Fantastic 4 offers the best implementation of the movie it’s based upon. 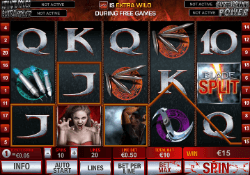 Unlike the other slots on the list, it offers only one main bonus game, the free spins, but with 4 unique features – one for each character: expanding wild, increasing multiplier, human torch and freezing wild. The expected return here is 94.88%. You should notice that there is a 50 line version of Fantastic Four slot, but with much lower RTP (91.99%). We had many arguments if Iron Man 2 should be #1 on our list of Best Marvel slots. It’s definitely #1 in terms of visual effects and graphics and also the one that offers the highest RTP between them all – 95.98%. 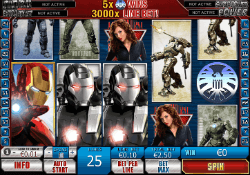 The main bonus feature of Iron Man 2 slot is the free spins, which come with an increasing multiplier. On top of that, you can enjoy 6 stacked symbols which add to the general appeal of the game and can be quite rewarding. Stacked with multiple bonus features, this is one slot that will keep you on your toes. 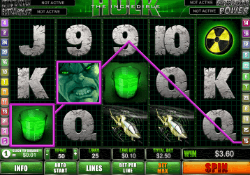 Free spins with x3 multiplier, Hulk’s Smash bonus and the rewarding Expending wilds. The last feature is my favorite: the wild reel/reels remain and you get 1 or 2 respins which can get you some nice payouts. 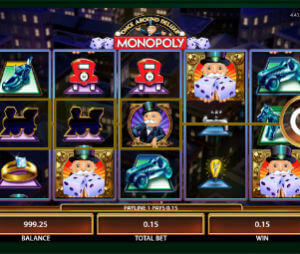 Similar to Fantastic 4 slot, the 25 line version offers the highest payout of 94.82% vs. 91% of the 50 line game. Great slot with 2 bonus features and 2 free spins variations. The Free spins have 2 modes, the Villains version which gives you 8 spins and the Heroes, which can go unlimited number of spins. Obviously it’s not really unlimited, but it can go quite a lot. 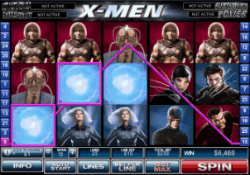 The RTP of X-Men slot machine is 95.03%. Besides 15 free spins and increasing multiplier, Blade slot has a unique Split feature. When the Split symbols appears on reel 5 (see the image), the reel gets split in two, which allows 6 of a kind winning combinations.